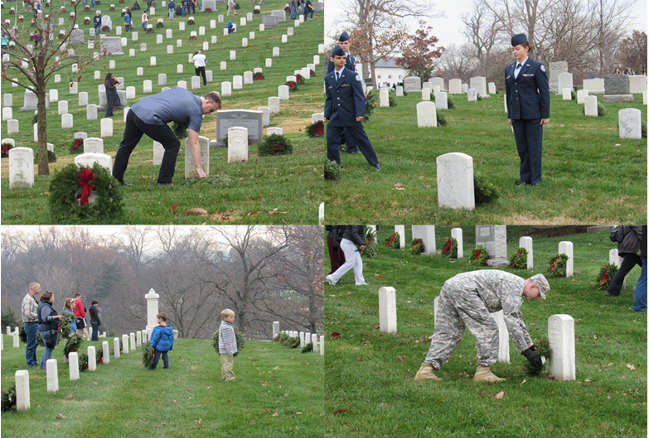 To support the Wreaths Across America mission to Honor, Remember and Teach, FASTPORT encouraged over 40 industry-leading companies to join the annual wreath-laying ceremony at Arlington National Cemetery following the historic ESGR Statement of Support Signings at the Pentagon. Now a nationally recognized event, Wreaths Across America began in 1992 with two people and one idea: to teach people to honor and remember Veterans. That year, orders were down for holiday wreaths that Morrill and Karen Worcester’s company produced, and they had 5,000 wreaths left over. As the Worcesters considered what to do with the leftover wreaths, Morrill remembered how impactful visiting Arlington National Cemetery had been as a child. Inspired by that memory, he called a truck driver friend to invited his family on a trip to Arlington where they would all place wreaths on Veteran graves with their children. He believed that it would help teach the next generation the value of honoring Veterans past and present. Little did he know just how far that lesson would spread in a few short years. After years of this wreath-laying tradition, something changed in 2005. That year it snowed, and a Pentagon photographer snapped a picture of the wreaths and posted the photo online. The photo went viral, and suddenly the Worcester’s mailbox was stuffed with donations from kind strangers. To ensure those donations would contribute to the mission to remember, honor and teach, Morrill and Karen officially founded Wreaths Across America. The phenomenon has steadily grown since then and culminated on Saturday when a convoy of trucks filled to the brim with wreaths passed thousands of spectators waving flags and waiting to take part in the effort. As the truck drivers parked their precious cargo, lines of volunteers formed to carry wreaths and place them on each Veteran‘s grave in the cemetery. Top left: FASTPORT Co-Founder Jim Ray places wreaths; Top Right: Officer stands at attention after the ceremony; Bottom left: Two children with their families take part in the Wreaths tradition; Bottom right: A Solider places his wreath of a Veteran's grave. During the official Wreaths Ceremony, Sergeant Major Bryan Battaglia expressed his gratitude for the focus on honoring our nation’s military heroes. Sgt. Maj. Battaglia is the second Senior Enlisted Advisor to the Chairman of the Joint Chiefs of Staff and the senior non-commissioned officer of the Armed Forces. Dozens of current military service members actively participated in the wreath-laying event alongside the thousands of civilian volunteers. This teamwork was noted and showed that remembering the Fallen is the duty of all citizens (military and civilian), and that Wreaths Across America is instrumental in promoting that goal. To learn more about Wreaths Across America and its mission to Remember, Honor and Teach, visit their website here.